While passing through Baltimore on vacation, I met a couple of lovely artists, David Page and Lauren Schott. 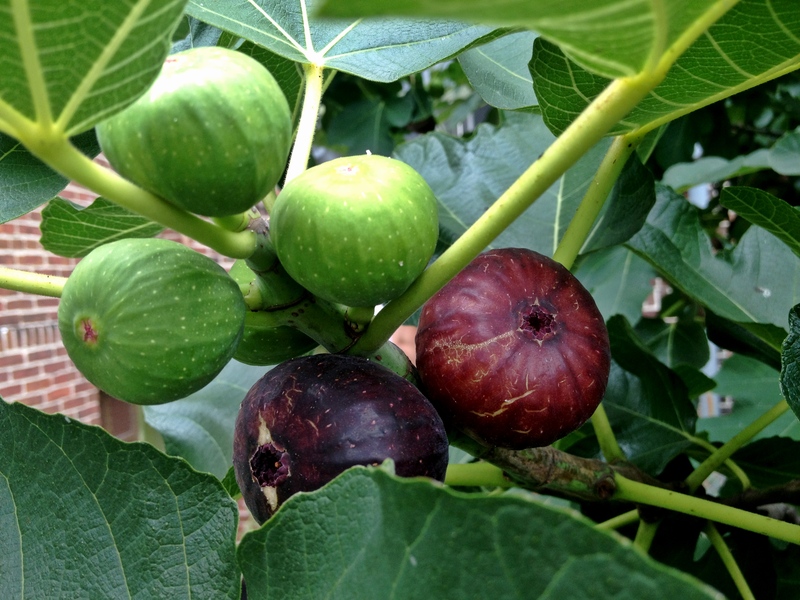 Over a dinner that featured two kinds of bone marrow and necessitated a trip to the basement to use power tools, it came out that Lauren and David had three fig trees in their backyard and more figs that they could handle. Fueled by marrow and a good bit of wine, I invited myself and my Baltimore hosts Beth and Don to a fig picking brunch. Two days later, we arrived bearing a basket. Lauren explained how to identify the figs that were ready for picking (they’ve started to split at what I like to think of as the belly button) and we got to work. This is about two-thirds of what we picked. And Lauren assured us that there would be just as many the next day. 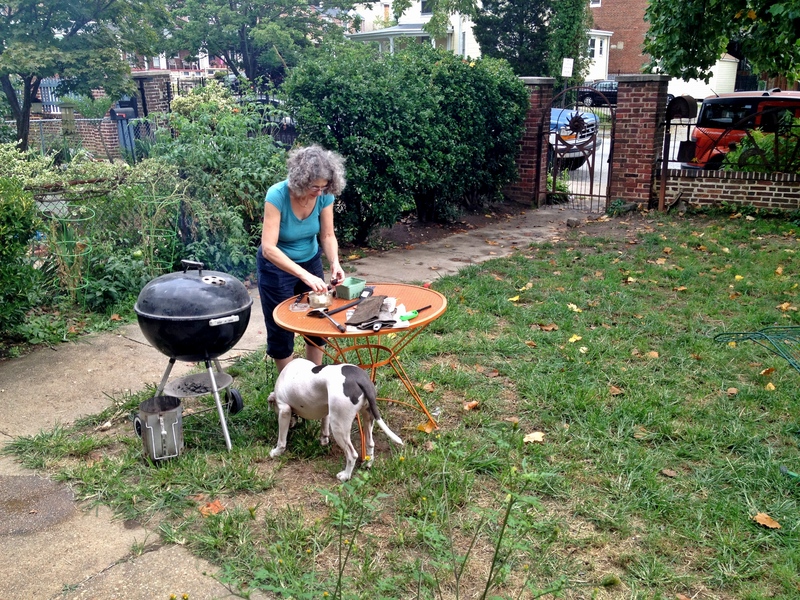 Fig picking completed, we retired to the front porch, which has a distinctly Baltimore feel to it. 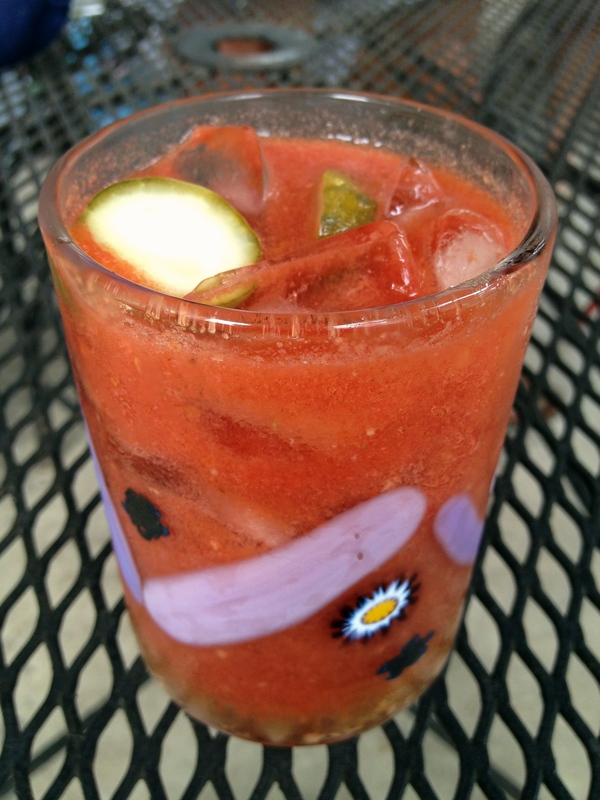 Lauren poured a round of bloody marys that she made using tomato “seconds” from the farmers market. They hit the spot. Lauren and David’s two giant dogs stuck close to her as she prepped for our first course on a Weber grill in the front yard. 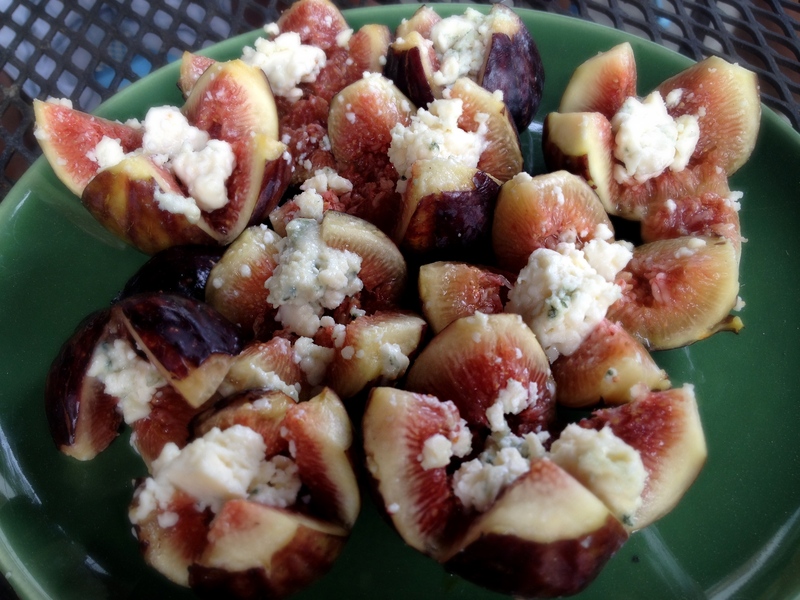 Grilled figs stuffed with blue cheese are good. A little freshly ground pepper makes them even better. 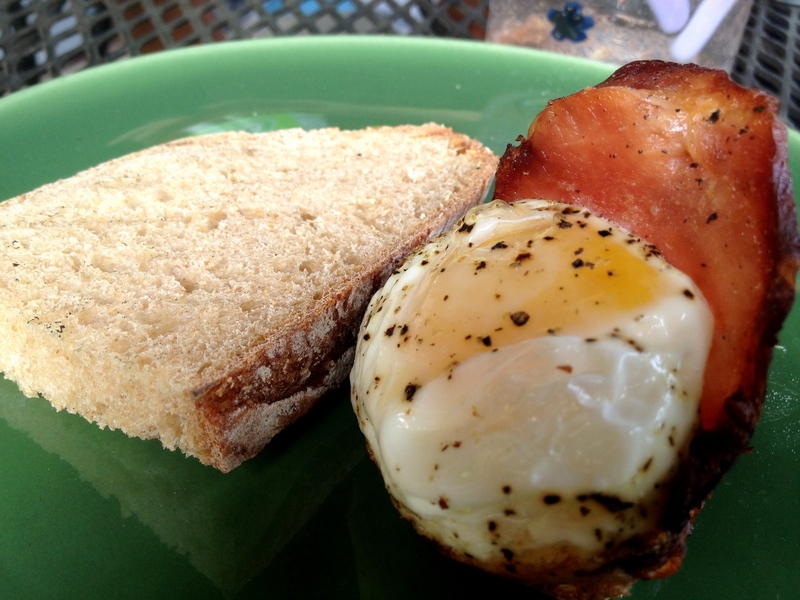 Eggs cooked inside of Canadian bacon cups and toasted peasant bread followed. Lauren did this all on the grill, using a cast iron muffin tin to cook the bacon and eggs. Cooking eggs for a crowd can be tough. (I frequently resort to a frittata or quiche, which can be prepared all at once and served hot or at room temperature.) I made a note of this technique. When we had finished eating, David took me and Beth on a tour of his studio space and some of the pieces that he was working on for an upcoming show in Philadelphia. 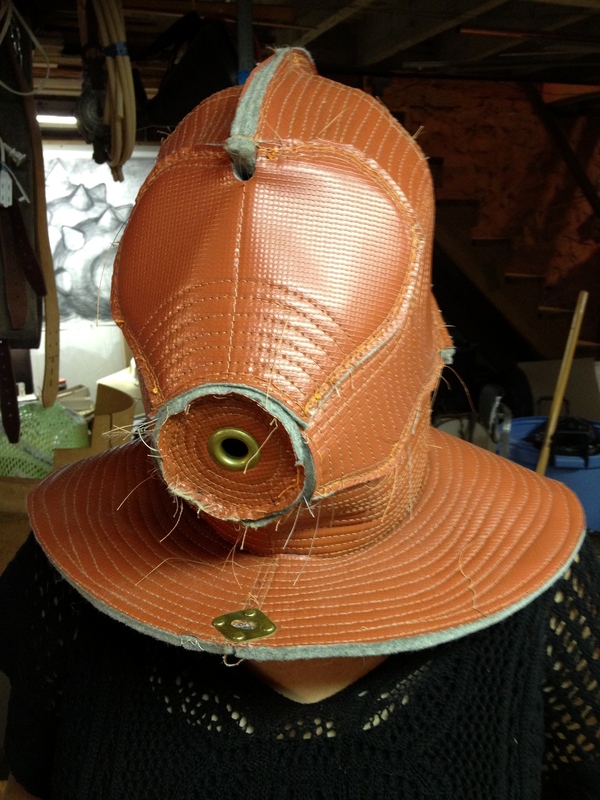 This mask is part of a head-to-toe suit that will be worn by a volunteer during the show. David was kind enough to humor us. It was dark in there. I could have spent the rest of the day hanging out on Lauren and David’s front porch, but I imagine they had other things to do–and I had a train to catch–so off we went with our basket of figs. Two weeks later, as I sat at my desk contemplating a mountain of work, a package arrived. Apparently Don had been busy. It contained jars of homemade fig pickles and fig barbecue sauce. The fig love continues. This entry was posted in breakfast, holidays & occasions and tagged blue cheese, Canadian bacon, eggs, figs, pork by Jasmine Nielsen. Bookmark the permalink.